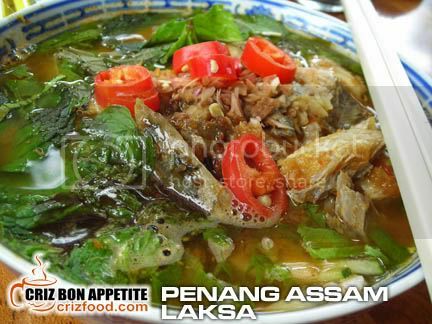 Penang is truly a food paradise of Malaysia. Every loops and corners in any district, you would find eateries regardless of Chinese, Malay or Indians hidden within small lanes, beach fronts, flats, industrial areas or simply residence areas. One such area which I had found to be real fascinating would be the Weld Quay/Macallum Street area. There were the best woodfire pizzas, cheapest stir fry Chinese cuisine (choo char), freshly fried prawn fritters, best tom yam fish head noodles, best pan mee, cheapest fried udon and now a new encounter with a yam rice of a different kind – Eng Yam Rice. 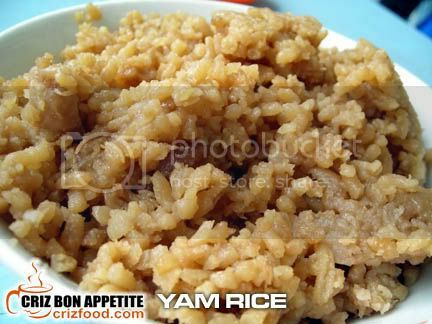 What made Eng Yam Rice so special? If compared to my most frequent yam rice stall in Chai Leng Park, Butterworth or their recently opened yam rice branch along Jalan C.Y. Choy, I would choose Eng Yam Rice. The difference lied in the yam rice. Each whole rice grain from here had the right texture and softness, combined with the thorough coating from the fragrant dark soy sauce, mixed with the right saltiness from the dried shrimps and beautiful powdery bites from the yam cubes. 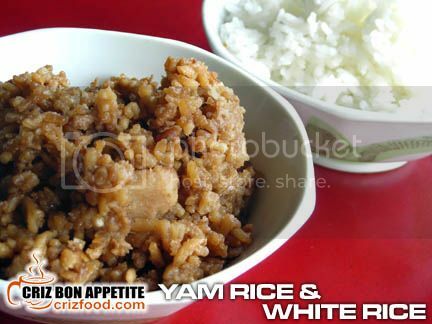 I can just have bowls of this yummy yam rice even without ordering any side dishes. Speaking of side dishes, what you get here would be a bit different compared to the salted vegetable assorted pork soup and dark soy sauce pork trotter you get from the BM Yam Rice stall over in mainland Penang or even some stalls which would serve you with assorted Yong Tau Foo soup. To go with your yam/white rice, you can order one of their sets which would include a hard boiled egg, a piece of fried bean curd and some pork belly meat, cooked in thick and flavorful herbs and spices filled dark soy sauce – all in a bowl for only RM2. It was cheap and good! 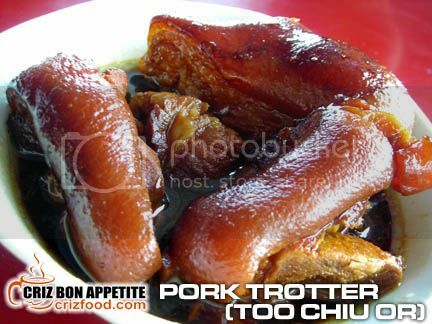 Even the Pork Trotter (RM4) had the same quality as they also came from the same thick and flavorful braising sauce. The meat was tender and each bite was beautiful. The wonderful part of dining here would be the choices of soup available with your meal. The stall would have RANDOMLY at least 3 types of soup each day. 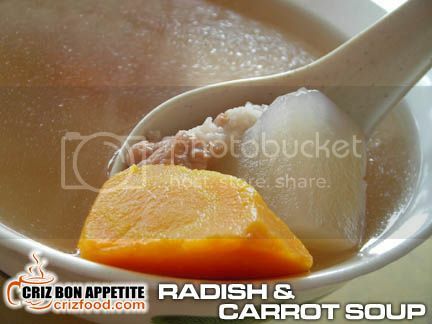 Firstly, there was the Radish and Carrot Soup (RM2/bowl). There was a generous amount of vegetables in the bowl with some pieces of pork. This bowl of soup was perfect with my yam rice. 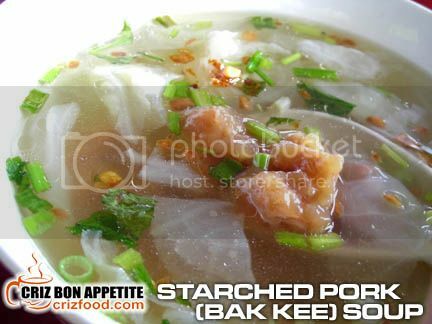 Starched Pork with Cabbage Soup (Bak Kee Soup – RM2/bowl) was also available for the day. Although this soup was a lot cheaper than the one I had at the coffee shop along Lorong Carnarvon, the cooking style was different. 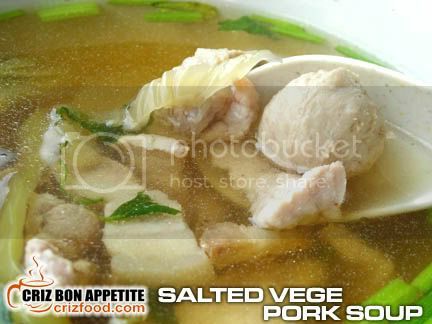 They used pork chunks coated with corn flour instead of pork slices. I personally felt that it had lost the bite sensation. The Salted Fish Tofu Soup (RM2/bowl) was another of my favorite here. 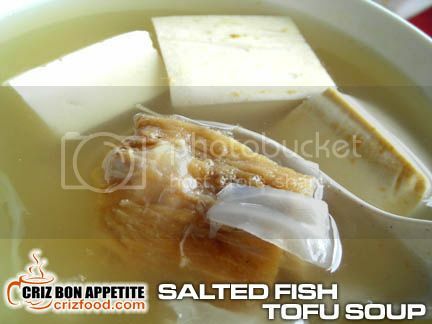 The tofu cubes were mildly fried and the salted fish did not have that overpowering fishy taste. Combined with some cabbages, the soup was full of flavors. The only problem would be that they do not serve this soup daily. It’s up to your luck to get to try this out. 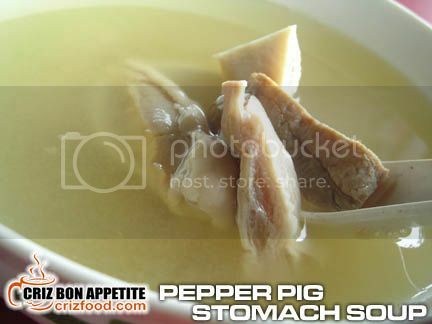 Another soup that you would get only during weekends (Saturday & Sunday) would be the Pepper Pig Stomach Soup (Too Tor Th’ng – RM3/bowl). 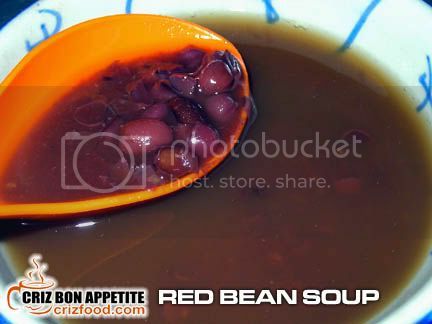 It would be a waste if you did not try out this soup. The pepper taste combined with the thick soup broth was marvelous. The only hiccup was that they do not have added ginkgo nuts. That would make the soup perfect. On top of the meat and soup dishes, Prawn Fritters (RM1/pc) were also available. They would come with the chef’s own created garlic chili paste. Although I found the fritters to be lack of prawns but they were indeed real crispy. What’s there to complain at the price I paid? Finding the stall won’t be hard as it’s just at the junction of Pengkalan Weld and Gat Lebuh Macallum. The only problem would be the parking space. If you are coming from the ferry terminal toward the Jelutong Expressway, you would see the Pengkalan Weld/Gat Lebuh Macallum traffic lights (the stall is actually opposite in a corner coffee shop named Kedai Kopi Sing May Mah). Turn left into Gat Lebuh Macallum and then turn right after the road divider into Gat Lebuh Cecil 1. There would be a lot of parking space there within the PDC flats area (you can get a lot of cheap and nice food here during dinner time). Moreover, I Mum Mum Pan Mee shop is just steps away from the yam rice stall. Address: 214, Gat Lebuh Macallum, 10300 Penang, Malaysia. I had tried so many types of Pan Mee from many parts of the country which include places such as the Bukit Jambul flat area (Penang), Green Lane Genting Café (Penang), Petaling Street Chinatown (Kuala Lumpur), Klang’s Mee Hoon Kuih (Selangor) and Seri Kembangan rural area (Selangor), that came in many shapes and flavors. No doubt each individual shop has its own style of cooking and flavor but I have yet to see one that has the uniqueness as I had experienced at I Mum Mum Pan Mee shop along the starting point of the Jelutong Expressway, somewhere in Georgetown, Penang. The little restaurant hidden away below a block of flats had some great versions of Pan Mee to cater to the ever flowing appetite of not only to the residents there but many others who had heard about them by word-of-mouth. Initially located as a stall in one of the prewar coffee shop in Pulau Tikus, Penang, more than 5 years back, the husband and wife team who were stationed in London for sometime had decided to come back Malaysia to open up a Pan Mee specialist restaurant. Some may ask what’s Pan Mee (Board Noodles/Ban Mian/板麵). 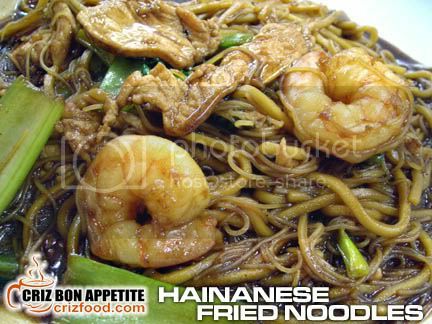 It’s actually a Hokkien dish originated from Fujian, China. 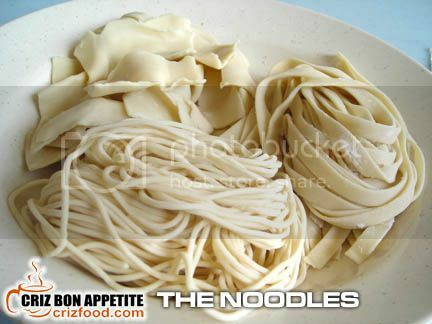 The noodles comprised of flattened hand kneaded noodles, usually served either in broad pieces, angel hair spaghetti like thinness or slightly thicker as shown below. The choice of Pan Mee here can be quite limited. That’s because the locals here prefer the original version rather than those purple sweet potatoes, orange carrot, yellow pumpkin, green spinach versions as I had mentioned earlier. 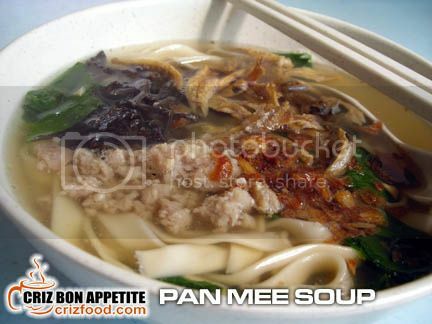 Let’s look at the Pan Mee Soup (RM2.80/RM3.30). Normally most health conscious people would go for this as the soup base would be vegetables filled with the sweetness coming from the fragrantly fried anchovies. The bowl of Pan Mee would have your choice of noodles, minced pork, fried anchovies, wood ear fungus, sweet leaves (sayur manis/star gooseberry/馬尼菜), garnished with some garlic oil. It was perfect! 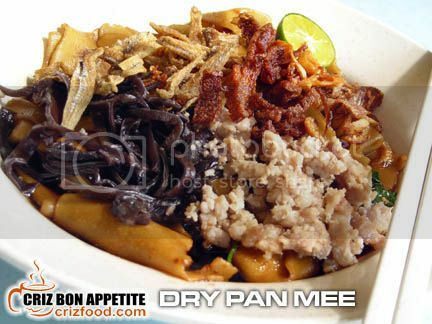 You can even have the dry version – Dry Pan Mee (RM2.80/RM3.30) which has the exact ingredients except that the noodles would be stirred in some dark soy sauce and sesame oil. It was real delicious. This set would come with a small bowl of anchovy soup. For those who love to have their noodles a bit spicier, you can opt for the Spicy Pan Mee (RM3.20/RM3.70). Basically, everything would be the same as the Dry Pan Mee except it has some dried chili flakes and meatballs. This set would come with a small bowl of anchovy soup too. 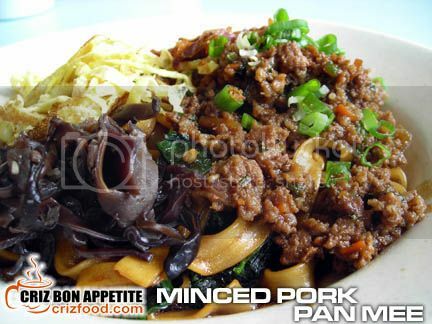 The next option would be the Minced Pork Pan Mee with Special Sauce (RM3.50/RM4.00). 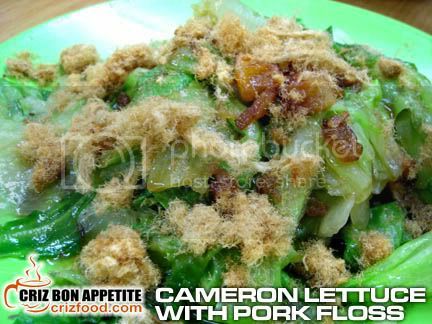 This would be a dry version and you would get quite a generous portion of the chef’s specially stir fried minced pork, wood ear fungus, sweet leaves and some sliced omelette, garnished with chopped spring onions. This was very tasty with a hint of fermented bean paste and chopped carrots emitting from the minced pork. This set would come with a small bowl of anchovy soup too. 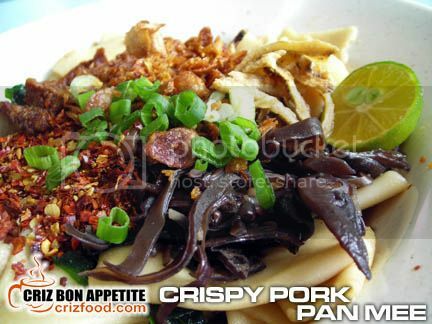 The last option was the Crispy Pork Pan Mee (RM3.50/RM4.00). This is my all time favorite. 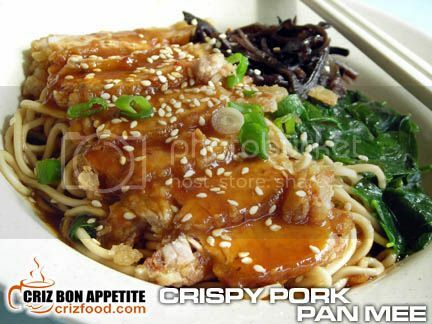 On top of the selected choice of noodles, I had a generous portion of wood ear fungus, sweet leaves and some delicious sliced crispy pork chop, garnished with some chopped spring onions and toasted sesame seeds. 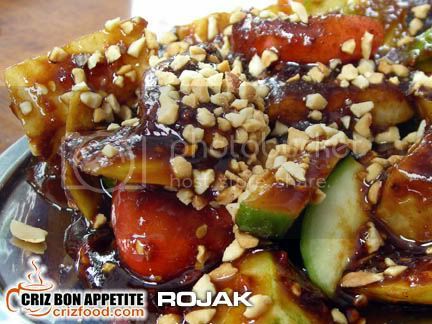 The accompanied sauce on the pork chop has a combination of mild spiciness, sweet and sour taste. This is a must order dish! There are about 8 items you can add on onto your noodles here in this restaurant but I love to have some soup based ingredients. Thus I have a bowl of rich and aromatic soup with some pork dumplings (水餃 – RM0.70/each), fish dumplings (魚餃 – RM0.50/each) and meatballs (肉丸 – RM0.50/each). 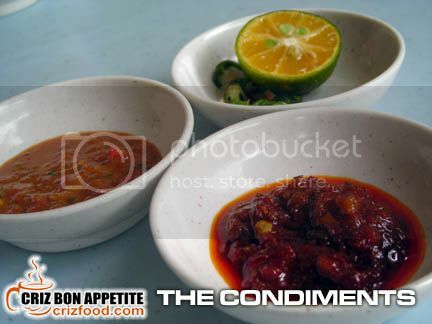 The restaurant would also provide some wonderful homemade condiments to go with the noodles which consist of blended chili, bird eye chili and also the fragrantly fried chili paste. Please take note that this is a non air-conditioned restaurant but you can always cool yourself down with their daily home cooked herbal tea. If you are coming from Komtar/Prangin Mall area along Jalan Dr. Lim Chwee Leong, drive all the way until the Jalan Dr. Lim Chwee Leong/Lebuh Carnavon traffic lights. Drive on until you have reached the Jalan Dr. Lim Chwee Leong/Lebuh Pantai traffic lights. Drive on again into Gat Lorong Prangin until you see the Weld Quay/Pengkalan Weld traffic lights. Turn right and drive towards the Pengkalan Weld/Gat Lebuh Macallum traffic lights. Slow down and keep to your left after the traffic light. Watch out for a service road (barely few meters away) on your left. Turn in and you would see a few I Mum Mum signs on your left. That’s where the restaurant is. Address: No, 294, PDC Flats, Pengkalan Weld, 10300 Penang, Malaysia. Note: Due to parking problems, Yaw’s Roast & Grill has shifted their business back to their previous premises (1, Gerbang Midlands, 10350 Penang, Malaysia) as at March 2010. Aww… I really missed this western food corner previously located somewhere in the residence area of Pulau Tikus. It was a dimly lighted, cozy and romantic place to be in for some quiet moments. If not for the local municipal council’s pressure to shut down the place, it would be indeed a love nest for couples. Anyway, the little homely restaurant had recently relocated to a brighter and more spacious venue along Jalan Transfer, just next to the Caltex petrol kiosk. The menu had remained the same but the pricing had increased a bit since my last visit there. After all, it was not exorbitant as we have to understand that the price of ingredients had increased quite a lot recently. Moreover, the price of food ordered here are net priced. 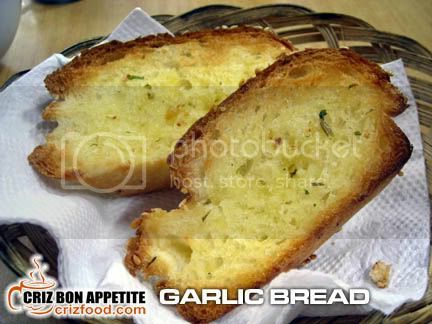 As usual, garlic toasts were given complimentary from the kitchen, slightly toasted to perfection with yummy garlic butter and herbs. A piece each was not really enough for two persons but what would a person expect when they are free right? Anyway, you can always order more but I did not find out how much they would cost. Since it was their opening day, there were no special dishes of the day. 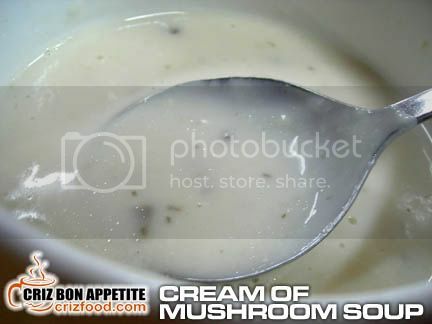 I ordered the Cream of Mushroom Soup (RM4.50) as starter. The soup was creamy with chunks of finely chopped mushroom. It was normal for me as what you would get from any of those economical western food stalls around town. Somehow, I felt that what I had at Louis Café, just a block away, tasted better. Again, you can’t compare a RM10 (excluding tax) bowl of Italianese Wild Mushroom Soup with something less than half the price here, right? The main meals were served quite promptly. 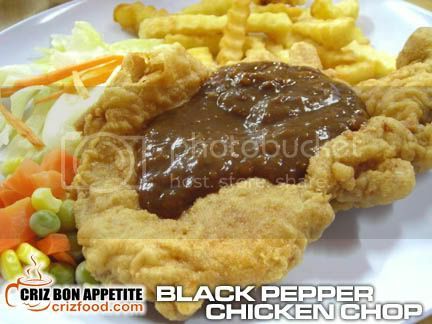 It was my favorite Black Pepper Chicken Chop (RM8.00). The chicken was finely fried with the chef’s special breaded flour and it was crunchy indeed. As usual, I would request for a separate but additional amount of black pepper sauce for me to dip in my fries. The gravy was as thick as ever but mild in hotness as this place was also the western food venue for a lot of families with children. The next meal was the Spaghetti in White Mushroom Sauce (RM8.50). The amount served was quite reasonable with 6 large meatballs garnished on top. The dish had some sliced mushroom, chopped coriander and sprinkled with some mixed herbs. The texture for the spaghetti was softer than the ones I had at QEII, which was based on the Italian’s choice of springiness. The mushroom gravy was just normal with not much distinctive flavors, except for the taste of the herb garnishing. The fried meatballs tasted great with the right amount of flavoring. They had a hint of some cheese like substance inside. The only drawback was that they could have added in more corn flour to make them a bit softer. Since the waitress did mention that they have some local dishes served as well, I ordered their famous Hainanese Fried Noodles (RM4.50). It was in fact Hokkien Char. The serving was a bit small for an individual but the amount of ingredients such as meat slices, large prawns and a generous amount of Chinese cabbage (choy sum) justified the price well. The dish was indeed quite tasty. It’s so much easier to locate this newly relocated restaurant compared to the earlier one. If you are coming from Jalan Penang into Jalan Burmah, keep to your right and turn into Jalan Transfer. You can see a used car shop just at the junction. Just drive until the traffic light. After the traffic light, keep to your right and drive until you see the Caltex petrol kiosk. The restaurant is just located right before the petrol kiosk under the name Dim Dim Yuen (serving dim sum and chicken rice in the morning). 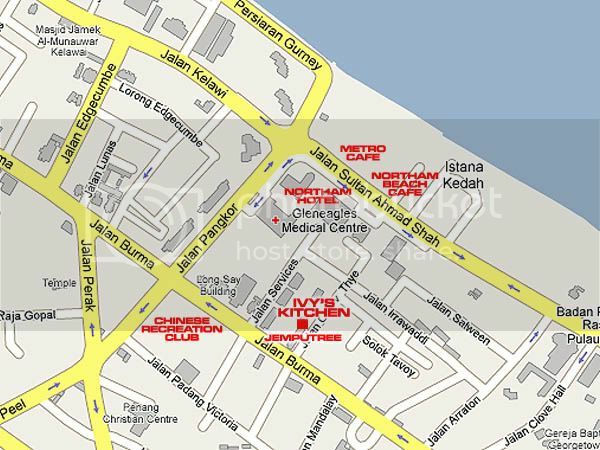 Address: 25 & 27, Jalan Transfer, 10050 Penang, Malaysia. The experience there was like gazing through the horizon of the Straits of Malacca as the orange orb danced with the blueness of the sky, waving one last ray before slipping itself behind the hills of a scenic Penang. The soft, breezy cold wind and the view of the sailboats and moving ferries being thrown into silhouettes indeed made QEII an ideal place for romantic couples to dine in. Tourists of all nationalities arriving from visiting international cruisers, berthed at the nearby Frank Swettenham Pier, can be seen flowing into the bar and grill for some early celebrations. By the year 2012, you would see more changes along the Weld Quay stretch with the ongoing RM500 million “The Pier at Weld Quay” projects, where there would be the “old meet new” restoration and construction of a boutique hotel (The RiceMiller), commercial plaza (Straits Capital Plaza), tourism school (Georgetown College – Centre for Tourism and Hospitality Studies), retail podium (Pier Market), apartment suites (The RiceMiller Residences) and townhouses (Heritage Suites). Upon completion, this urban landmark, facing the present Tanjung City Marina, will not only enhance the skyline, but rank Penang alongside other renowned port-cities of the world. Located at one of Penang’s heritage piers named Church Street Pier, Tanjung City Marina, QEII Restaurant claimed to serve the best of the best in terms of quality food with equal finesse to make each meal a memorable one, whether within the bar area or al fresco. Moreover, they are also providing a great place for people to chill out with many unique styles of lounges. From my first time experience there, they had indeed proven their worthiness with what they had promised. Dinner was simple and yet elegant as my intention of going there was for their much acclaimed pizzas. Somehow, there were just too many choices in their carefully selected menu that tempted me to order more. The Lobster Bisque (RM16) was rather special. It was creamy rich with smooth flowing lobster puree stirred in white cream with a touch of white wine and cognac. The soup had a very distinctive shellfish flavor with chunks of fresh lobster meat, garnished with some chopped coriander. It could be rather intruding for those who are not in favor of strong shellfish taste but I was fine with it. Carbonara pasta has always been my favorite and thus I tried out their Linguini Carbonara (RM23). The serving was large. The dish had a generous amount of sautéed beef bacon and egg in white cream sauce. The usage of fresh and dried herbs together with some smashed garlic and sliced mushroom was just right. This was one of the best carbonara I had so far from any of my visits elsewhere. Although the linguini pasta was as bit hard for the Asian’s preference (but that’s how the Italians loved it), the whole combination blended in perfectly. 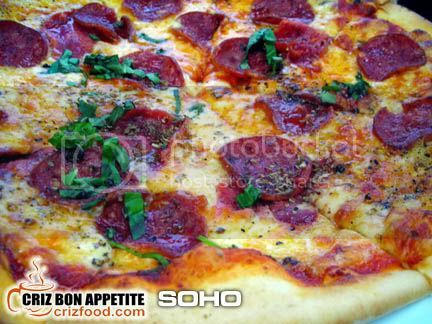 While enjoying our starters, the aroma of freshly baked pizza began to drift into our nostrils. 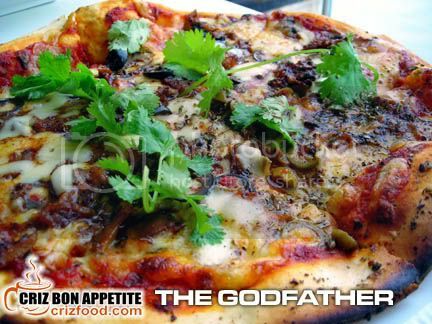 The pizza we ordered which was nicknamed as The Godfather (8”-RM26, 12”-RM32) was presented not long after that. It had freshly made dough, rolled thinly and spread with freshly made tomato puree, sautéed spicy clams (lala), dried chili, sweet & spicy sauce and topped with lots of Mozzarella cheese and cilantro, baked to perfection in a wood fire oven. With the first bite, I could not stop eating. The crust was well baked without any sign of flimsiness as none of the toppings fell down on my plate. 😛 It was truly the work of an experience chef as this sort of pizza required quite a tedious time shifting and rotating in high heat within the wood fire oven. For those who love to have a simpler topping, you can always opt for Soho (8”-RM39, 12”-RM45). On top of the crispy thin crust, the pizza had a generous amount of pepperoni, fresh pears, onions, pine nuts, topped with 3 different types of cheese such as Cheddar, Mozzarella and Gorgonzola, garnished with field greens. The taste was remarkably unique and tasty. 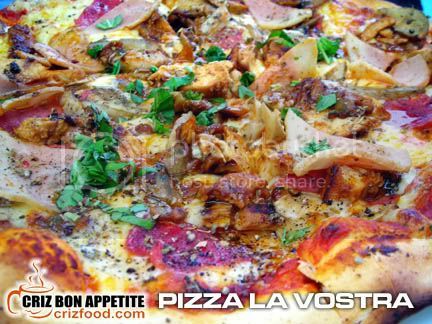 If you are in a creativity mood, you can always combine your own in the Pizza La Vostra (8”-RM34, 12”-RM40). Just select 5 ingredients from the following ingredients such as grilled chicken, chicken ham, turkey bacon, tuna, egg, beef salami and pepperoni, red and green pepper, artichoke, mushroom, roma tomatoes, Kalamata olives, Virgin green olive, capers, mozzarella, gorgonzola, cheddar or feta cheese. Here the 12” order with grilled chicken, chicken ham, pepperoni, mushroom and mozzarella cheese. It was extremely filling. One of the most ordered pizza here would be the Penang Hot (8”-RM30, 12”-RM36). The pizza would have lots of fresh prawns in spicy sauce, topped with onions, garlic, chopped basil and mozzarella cheese. Who do you think was behind all the passionate baking of these delicious pizzas? It was none other than the experience Chef Joe who had worked alongside with Chef Emmanuel Stroobant (Chef In Black) when he was working in Meritus Hotel, Singapore. 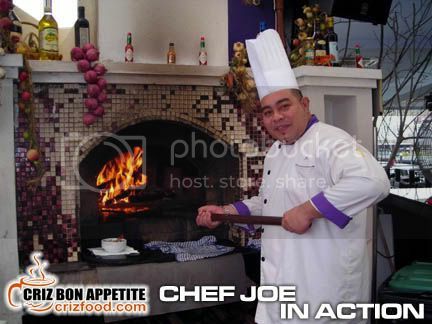 Unfortunately, Chef Joe had now left QEII but do not be sad as he would now be overseeing the Italian restaurant at Hard Rock Hotel, Penang, which would be officially launched on 19 September 2009. The dinner ended with some beautifully presented desserts. 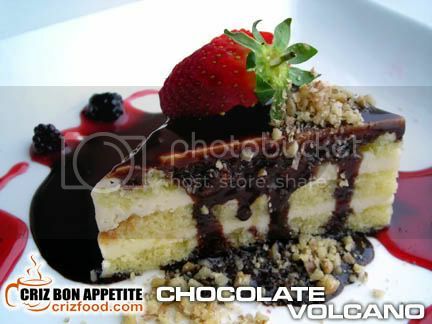 One of them was the Chocolate Volcano (RM12). Instead of a piece of rich chocolate moist cake as per menu, they gave me a piece of warm and moist butter cake with layered white chocolate mousse. I did not mind too as the cake was light and fluffy and truly delicious. It was dressed with oozing melted chocolate, one fresh strawberry, some chopped walnuts and presented with some sweet and tasty raspberries in jam sauce. It was heaven! 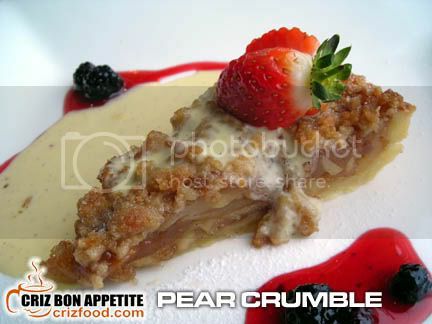 The next was the Pear Crumble (RM8). The warm grounded cinnamon cooked pears had the right sweetness for my taste bud. Although I would prefer a crunchier oat and hazelnut crust, the whole combination with white Anglaise cream, strawberry and raspberries in jam sauce did not disappoint me at all. If you are coming from Lebuh Light, you will see a roundabout with a stainless steel betel nut structure (Queen Victoria Memorial Clock Tower is just beside it). Drive straight after the roundabout and you will be right in Pengkalan Weld (Weld Quay). Just follow the road and you will see the Frank Swettenham Pier on your left. Drive a bit further and you will see the Church Street Pier on your left. QII Penang is just right at the end of the pier, just before Hai Nan Town Restaurant within the Tanjung City Marina. The ferry terminal is just after that. 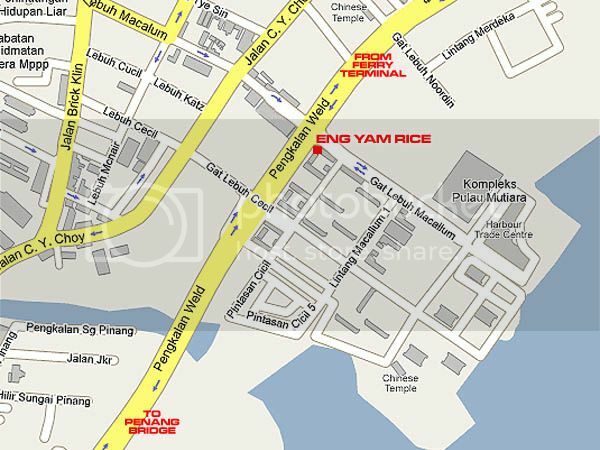 Address: Tanjung City Marina, Church Street Pier, 8A Pengkalan Weld, 10300 Penang, Malaysia. It’s has been quite some time since I had the opportunity to drop by my favorite yam rice shop at Chai Leng Park, Butterworth, Penang. Moreover, my most frequent Bak Kut Teh stall, Super Lai Lai Bak Kut Teh has also ceased operation late last year with an “imitation” opening up just few shops away and I was not impressed with the taste of the bak kut teh there. What should I do then with one shop so far away in mainland Penang and another lost from the face of earth? Frankly speaking, it has been a tough time finding those equivalents on the island. The nearest to the best that I had found, surprisingly both under different management, are located in a newly open café right in the heart of Georgetown. The café which was barely two weeks old is called San Dian Shui Specialize Cafe (三點水美食專門店). Well, every ingredients and cooking style looked the same but taste wise, it’s another story. Somehow the taste of the soup (RM8 for two pax) was not as I had expected. The meaty sweetness and presence of the salty vegetable was not so prominent at all. Maybe it was still early as I had patronized the café around 10.00am in the morning. That should not be the excuse since it’s supposed to open for business at 9.00am right? The sliced salted vegetables were indeed soaked too long until there was no taste in them. It was like munching some crunchy but tasteless pickles. Moreover, the taste of pepper was overpowering, especially towards the base of the soup. 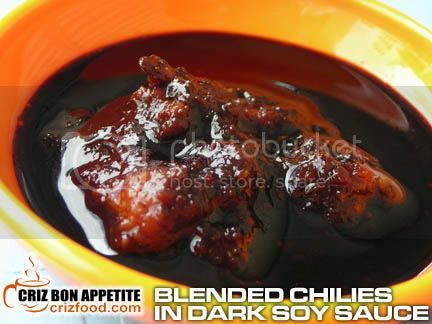 If not for the wonderful combination of sambal with dark soy sauce, it would be a total disaster. As for the yam rice (RM1/bowl), it was world of a difference compared to the one I had at Chai Leng Park. The rice was not fragrant form the dark soy sauce and soft with juiciness as the former. There were barely much signs of yam and the dried shrimps were minute and soaked too long too. Something ought to be done to the style of cooking. I guessed using a rice cooker and using a large pot to cook the rice over slow gas cooker heat indeed would give a different texture and taste. The life saving sambal with dark soy sauce was indeed good. In fact, it was spicier than the one at Chai Leng Park. I might have to revisit the place at a later date as it was still new and I guessed they will still need time to adjust the right taste of the public. Moreover, I did not get to try out their dark soy sauce braised knuckles as it was not ready yet. Let’s hope it would be as nice as the Chai Leng Park stall. If you like to try them out, they will serve from 9.00am until 5.00pm. Do check out the map at the bottom of the post. 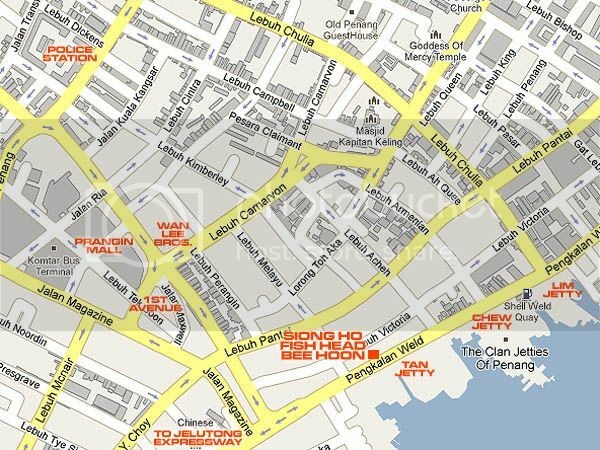 Branch Address: 231 Jalan C Y Choy, 10300 Penang, Malaysia. Another stall which would also serve yam rice, from 5.00pm until 10.00pm, would be the See Yang Yang Claypot Bak Kut Teh stall. 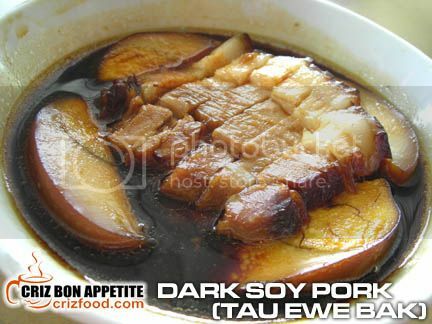 The taste of the soup was almost similar to my much admired Fei Kay Klang Bak Kut Teh I had last year in Selangor. It had the mild herbal but with a stronger licorice tangy taste. It was just nice with my bowl of rice. 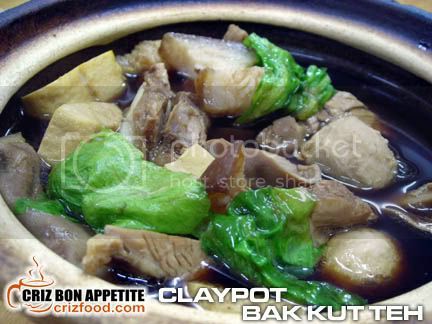 The clay pot bak kut teh which was filled almost to the brim with choice pieces of soft pork ribs, belly meat, pig’s stomach (too thor), meat balls and fried bean curd cost me just RM5.50. I would say it was the cheapest around with that amount of ingredients provided. 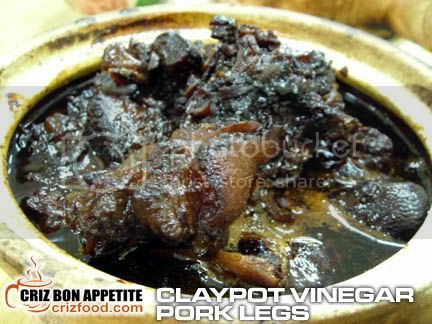 They do also have Braised Black Vinegar Pork Knuckles (Too Kar Chor – RM6) served in a clay pot. The whole dish was not that bad at all (except a bit sweet to my taste bud as I do not like my savory dishes to be over sweet) with the heat from the clay pot thickened the gravy within. The knuckles were nicely braised with old ginger and some dried chilies. 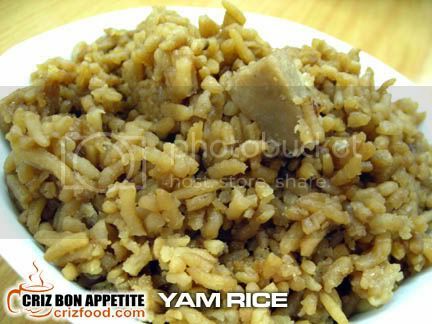 It was real appetizing to go with my yam rice. 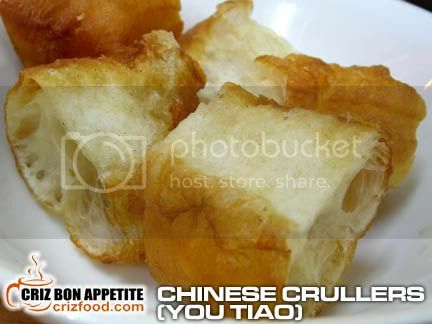 They also do have Chinese Crullers (You Tiao) to go with your bak kut teh. I just wondered why they did not get from the famous stall at People’s Court since they are so near there. It would be great if they get their supply there for the extra crispness. There yam rice in this evening session stall was indeed better. Although dry a bit due to my visit at 9.15pm, it has the right amount of yam and dried shrimps. The rice was also better than the morning session pork soup stall. It has a nice, thick and welcoming aroma with the right taste to go with my clay pot dishes. Hmm… but I still prefer the Chai Leng Park yam rice. LOL! Well, this is a healthier version with a lesser use of oil compared to the Chai Leng Park stall. Overall, it’s still good for me. It would not be hard at all if you know your way to the Cecil Street evening wet market (七條路巴刹). 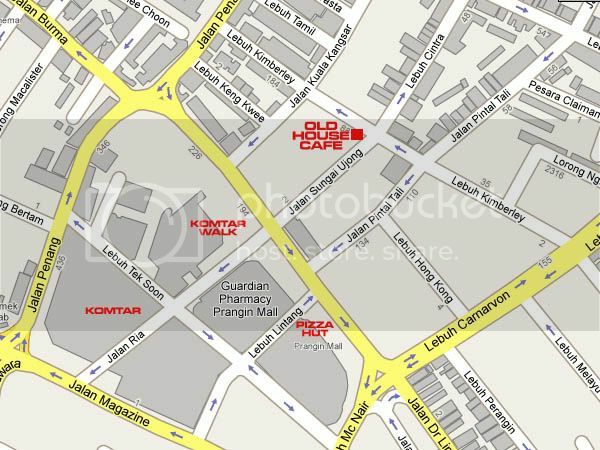 The café is just on your left hand side between Lebuh Katz and Lebuh Cecil. If you are coming from Jalan C.Y. Choy, you will see the Lebuh Macallum traffic lights. Immediately after the traffic lights, slow down and you will see the shop with attap leaves awnings on your left. Parking can be quite a hassle here as it’s located along a heavy trafficked area. It’s even worst if it’s during the evening market operation hours. I will advise you to park at the limited parking space at Lebuh Katz or within the Cecil Street wet market car park and walk up to the shop. 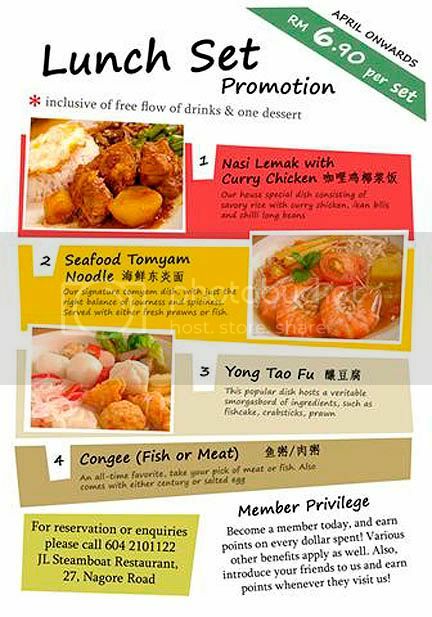 AUTHENTIC HOKKIEN DISHES IN PENANG? Before I elaborate more on the following dishes I had for lunch few days back, let’s have a look at the dishes and you tell me what would be the first thing that would come into your mind? Here was the meal which consisted of a meat dish, a seafood dish, a vegetable dish and a soup served with two bowls of rice. These dishes would be the ideal balance meal right? To any typical Chinese staying in Malaysia, you would also realize that during certain period of the year you would get dishes like this quite abundantly in most households, especially after some “praying”. To be frank, I was not so impressed at all with the dishes served and they were not even cooked by anyone in my household but from a new restaurant right in the heart of Georgetown. Those dishes were exactly like those served in tour trips to China where most of the dishes contained fatty meat and floated in pool of oil. This was the Chef’s Special Set Meal (RM10 per pax – minimum order two pax) that was recommended for my lunch. For those who know how to read in Chinese, please tell me what do you understand with “粗糧細做套餐” compared to the English name? It literally meant rough dishes made fine set meal. The English name was rather deceiving. Although the set meal was served quite promptly, the dishes got both our eyes staring at each other for minutes with mouth widely opened. “Huh? Everything’s so plain? Not even any added ingredients?” was our silent exclamation! There was just a piece of fried fish fillet to be shared between the two of us. No doubt it was fresh, thick and non-fishy taste but it was served just like that minus any presentation. 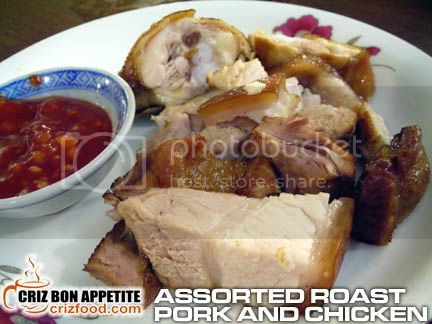 The next was just a few pieces of chopped roasted pork and two pieces of chicken meat served with chili sauce. This dish was barely enough for our consumptions. 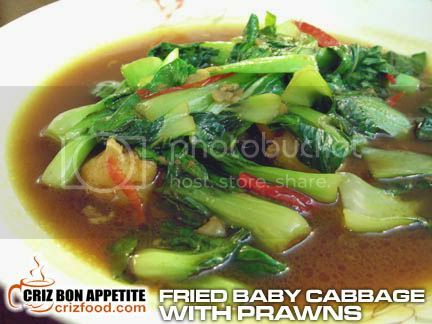 Fried baby cabbage with some irregular sized prawns was also in the set menu. It had nothing more than some oyster sauce and sliced chilies. The amount of oil used was unhealthy and it did look as though the oil had been used for frying something yellow. The soup which was Chop Suey (Kiam Cai Boey) was a complete laugh. It was just some leftover meat boiled with some mustard plants and salt. 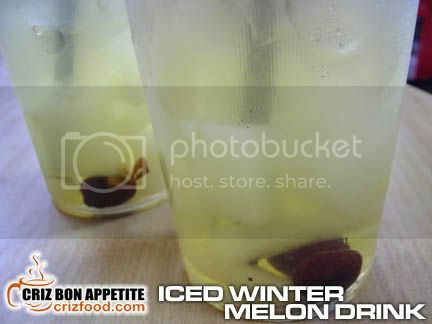 There were no signs of dried chilies, tamarind and lemon grass to pep up the fragrance and taste of this reputable dish. It was a disastrous bowl of soup. I could barely find pieces of meat in there as all of them had been cooked until floss like. Moreover, I was also trying to avoid the thick layer of oil floating on the soup. Something ought to be done by the kitchen to improve on this dish. Since the staff also claimed to have one of the best vegetarian dishes around, I tried out two of their vegetarian “pork rolls” which were so small and cost me RM2 each. Each roll had some yam paste and some vague bites of jicama and carrot. The fillings were not so generous after all. Moreover, the serving was cold. As for dessert, there were none. 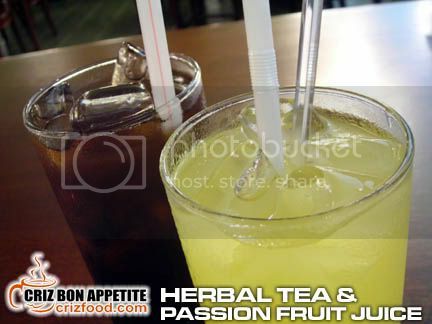 We only had a glass of herbal tea (RM1.50) and a glass of passion fruit cordial drink (RM2.50) to wash down our food. Overall, I found the restaurant barely has any dishes in the menu, except for different types of tea, hot and cold beverages, fizzy soda, beers, some over priced hawker food (RM7.50 –RM12) and some normal rice sets and vegetarian dishes. I did order a bowl of the pork ribs prawn noodles which was not served (although I did tick in their order chit) but I overheard from the next table that it was just average. Let’s hope this would be just their temporary menu until they have their official launch sometime next week. I sincerely hope that they would seriously look into their food section as it would be a huge disaster on top of the large amount of money spent on the refurbishment of such a beautiful building. Can you guess the name of the restaurant? 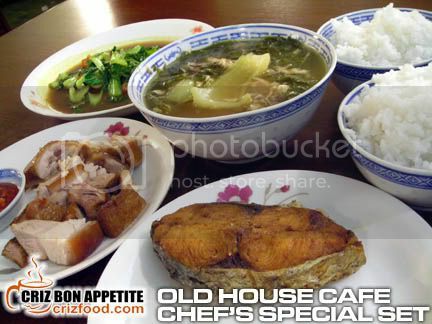 It’s the subsidiary company of the joss stick manufacturer, Bee Chin Heong – Old House Cafe. If you are driving from Jalan Penang into Jalan Dr. Lim Chwee Leong, turn left into Jalan Sungai Ujong upon seeing Komtar Walk on your right. 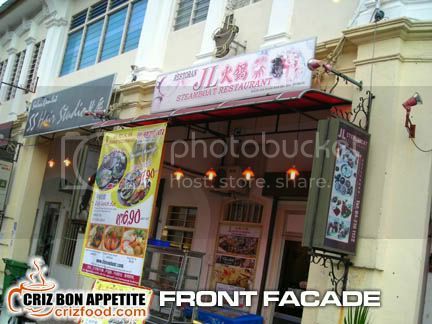 The restaurant is located at the junction of Lebuh Kimberley and Jalan Sungai Ujong. Parking can be quite a headache here during peak hours as Lebuh Kimberley and the surrounding Lebuh Cintra areas are popular with their hawker food. Branch Address: 145-153 Lebuh Kimberley, 10100 Penang, Malaysia. Note: This restaurant had ceased its operation and in its place is a new bak kut teh outlet. The management of JL Steamboat Restaurant had individually invited some of us recently to try out their food. Instead, we ended up having a group review. It was actually a fun gathering with the wacky companies of some of our Penang floggers which consist of Steven, Buzzing Bee, Jian, Allen Ooi and Mary Teo. The place was rather cozy with soft music and yet dimly light cubicles. It would be a bonus for those people who love to dine in privacy. 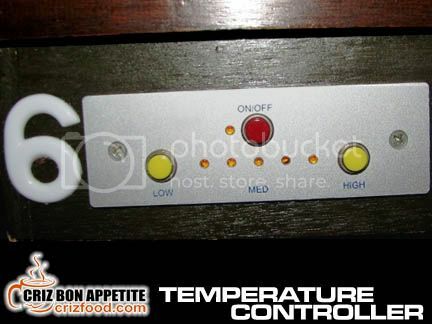 Each table would come with an electronically temperature control hot plate which you do not see much at many steamboat restaurants. When reaching the entrance of the restaurant, you would see a worker cooking up varieties of delicious meaty and seafood grills. The aroma flowing through the air got me hungry while waiting for the rest to arrive. I guessed this was one way to stop everyone from coming out of the restaurant smelling like a barbequed item. What else would you expect from an air conditioned restaurant right? LOL! Moreover, it was the management’s special treatment to ease its customers from getting splattered with greasy substance. You can see quite a variety of meats and seafood on the spread, including teppanyaki seafood skewers. 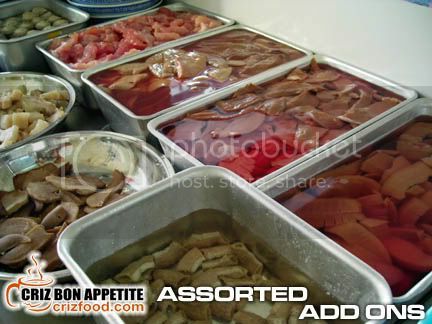 Upon entering you can see rows of other items meant for steamboat consisting basically a lot of meat and fish “balls”, some meat and intestines, mushrooms and seafood. One top of these, there would be some choices of noodles such as glass noodles, rice noodles, emperor’s noodles (王帝麵) and instant noodles. Other than fresh chicken eggs, there were also some vegetables such as Chinese cabbage, Cameron lettuce, cabbage and water morning glory (water spinach, kangkung, 蕹菜). I found one major vegetable ideal for steamboat missing here – the vitamin A rich crown-daisy chrysanthemum leaves (tang oh, 茼蒿). Maybe the vegetables were not in season then. Were they not or was it due to not many people liking the pungent smell? I won’t know for sure. 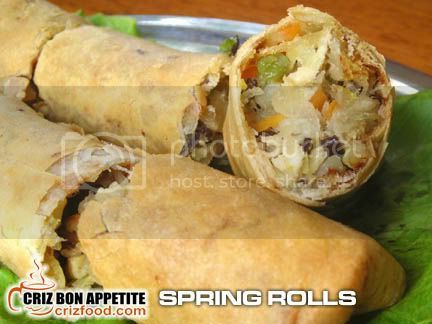 The restaurant could also consider adding in some bundled spring onion stalks to widen the spread. Prior to starting the meal or waiting for your other guests to arrive, you can have the option to start off with some basic side dishes. They may include dishes like fried rice, fried noodles, fried chicken wings, nuggets or fish cakes. We started off the meal with two of the four available steamboat stock, clear chicken soup and fish soup. The chicken soup was thick and nice except towards the end it became a bit too salty. So was the fish soup which was served to us with a few slices of ginger to cut down on the fishy taste. The restaurant should have had someone around to ask us if we would like to dilute the saltiness with some boiling water but no one did that. If they were to look into providing better service, at least they should look into this aspect of getting feedback from us. Of the two, I loved the fish stock more. The next batches of stocks were the herbal soup and tom yam soup. The herbal soup was nicely brewed with the right amount of herbs. There were some hints of wolfberries and ginseng roots and the taste was beautiful until the end of our meal. The fragrance and slight bitterness from the soup base would be ideal for those herbal soup lovers. Unfortunately, the tom yam soup was not up to my preference. It was too mild for my taste bud. It lacked the pungent taste and fragrance from some lemongrass stalks. I guessed I’m so use to the tom yam soup I had at Village Café. 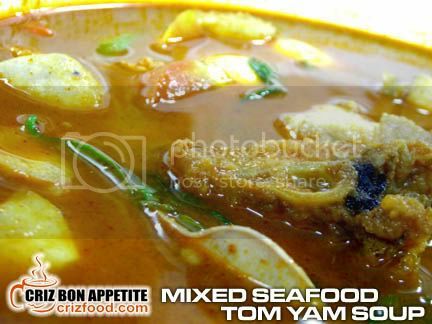 If you were to ask me to rate my preferences, it would be the fish soup, herbal soup, chicken soup and tom yam soup. My note to the management on the aspect of healthy dining would be to maintain the soup as natural as they can as most of the pre-processed items on the buffet spread already had the saltiness, preservative and sweetness in them. Even the sugar levels in the free flow chilled green tea and lemon tea were a bit too much for most of us there. A non sugar and hot beverage item such as Chinese tea would be a great addition. When it comes to sauces for steamboat and grills, I would say they have a great selection of pre-packed and homemade sauces. We had many choices such as tomato sauce, chili sauce, Thai chili sauce, soy sauce with bird’s eye chili, garlic oil, fresh chopped garlic, sate sauce, sambal udang tumis, Thai spicy green sauce and even Sukiyaki sauce specially meant for the teppanyaki skewers and grills. The sambal udang tumis which was somewhat like the curry mee chili paste, with added pounded dried shrimps remained my favorite. Can you guess how much we ate that night? Frankly, we did not really eat that much as there were more ladies than men (even included my paying god-bro). We only had these for the 4 different soups. On top of that, these grilled items were served to us almost continuously. Although most of us are stuffed that night, we still did not forgo the dessert section. With the beautifully twisted marshmallow on a skew and finger biscuits waving at us, welcoming us to dip them into the chocolate fountain, who could resist the temptation? There were also jellies, fresh fruits and black glutinous rice dessert. That was not the end to our enjoyment on top of our endless jokes and hilarious moments. All of us went back to our childhood years playing “masak-masak”. LOL! You can see some of us dripping saliva while trying to make something out from our “play dough”. Everyone wanted to have a hand in making their best decorated ice cream with the few different flavors of ice creams, chopped pickled cherries and rice candies. The results – everyone came up top… in their own category. LOL! Here are some of the masterpieces. 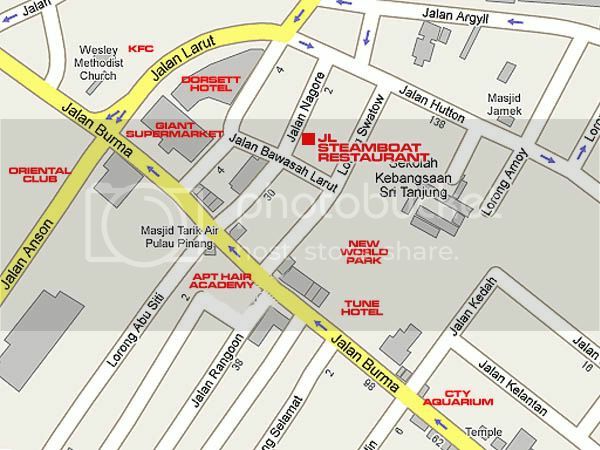 Finding JL Steamboat Restaurant won’t be hard as it’s located within Nagore Place (nearby New World Park). Find your way down Jalan Burma and keep a look out for the red paint splattered designed Tune Hotel building on your right. Immediately after that would be the New World Park food court. Watch out for the 2nd junction on your right after that. 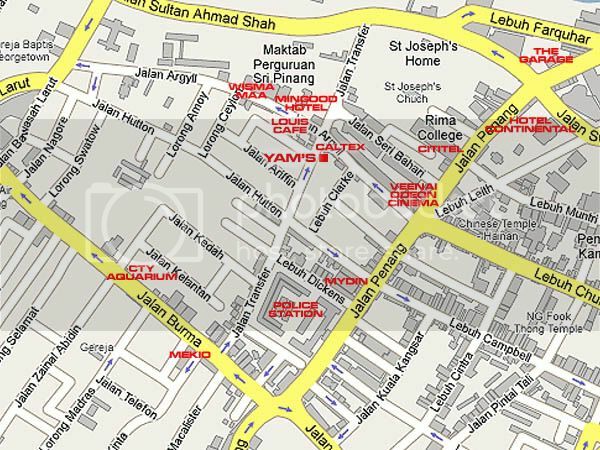 Turn right into Jalan Nagore and drive until a cross junction (Jalan Bawasah/Jalan Nagore). You can see the restaurant on your right (next to Sugar Dynasty Food Delight corner lot) after the cross junction. Parking could be quite limited here during lunch time and you should have lots of loose change too as the parking meter would go on until midnight. If you do not want to have the hassle of driving around finding a free space, I would recommend that you park your car within the New World Park parking lot and walk up to the restaurant. 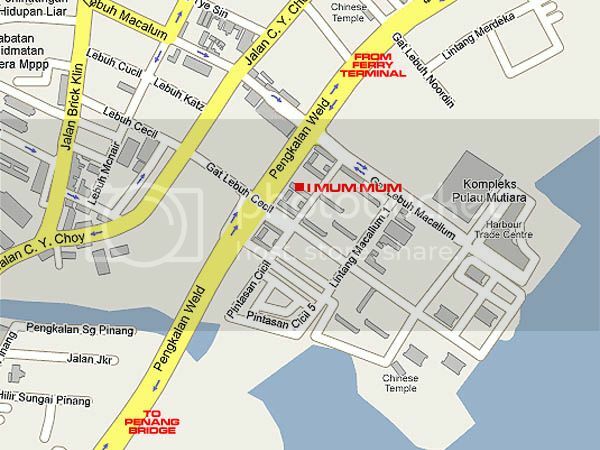 Address: 27, Jalan Nagore, 10050 Penang, Malaysia. Even before their signboard was up, I had paid umpteen visits to Siong Ho Fish Head Bee Hoon to savor some of their noodles and porridges. To show some appreciation to my frequent support, the boss, Mr. Teh (Ah Ho) had decided to throw in a small feast for a handful of us to try out all the seafood items he has in his café. Due to the choices of either clear or tom yam soup based dishes, just a few floggers had the privilege to get the invitation, namely myself, Steven, Gill & Jason, Buzzing Bee, NKOTB and Jian. What was my reason for visiting this café for my noodles and porridges so frequently? It’s definitely not due to humid weather, the signs of feeling sick soon or my huge appetite for spicy food but the secret lied in the soup. 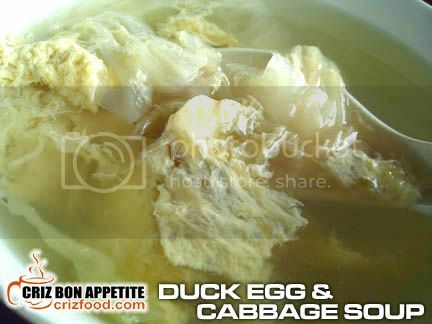 The soup has a specific recipe of chicken bones, some hint of dried shrimps and some of their secret ingredients. Even the tom yam paste they used was from a reputable brand from overseas. 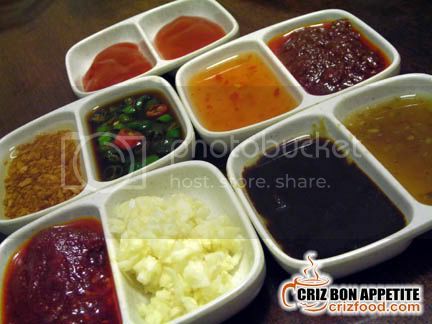 To start your meal, you would have 6 options to your bowl of hot steaming dish. You can either choose thin rice vermicelli (bee hoon), thick rice vermicelli (cho bee hoon), wheat flour vermicelli (mee suah), instant noodles (maggi mee), soya noodles (tao chiam) or porridge (moey). 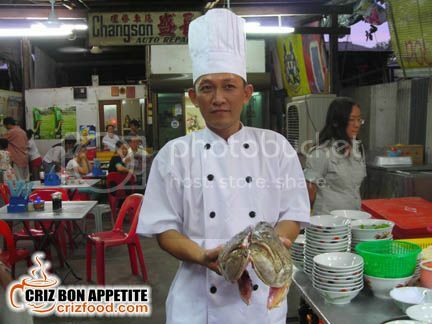 Next would be your choice of main ingredients such as large white prawns, grouper fish head, grouper fillet, fried “kalak” fish head, fried “kalak” fish fillet, mud crabs, flower crabs, mantis prawns, squids or frog. Some of the main items here would depend on market availability as the boss would only accept fresh ones from his suppliers. I will also like to give a short description here on the fishes. 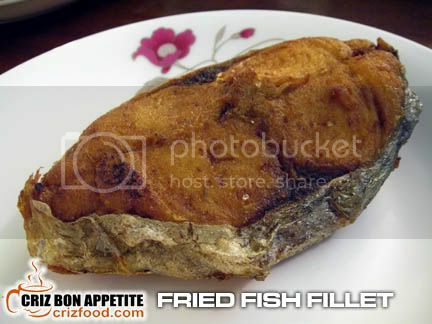 The grouper fish (kerapu, 石斑魚) is one of the most sought after fish locally due to the fine texture in the flesh. It’s also one of the more expensive fish in the local market. The “kalak” fish (ibu kerisi or goldband jobfish) as it is more commonly known as locally is loved for the softness in flesh and less fishy taste. Most local western cuisine restaurants would use them fresh for fish and chips rather than the frozen dory fish. 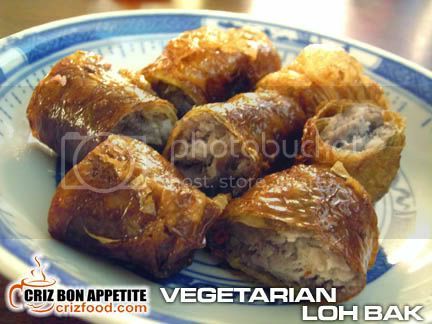 You could also have some addons to your dish such as pork kidney, minced meat, meat balls, fish ball, quail’s eggs and dried bean curd. To spice up your bowl of noodles, you might get some of these vegetables and herbs. No dishes would be presentable minus the colors of some garnishing. You could expect some cut red chillies, chili paddy and a bottle of dried fried chopped garlic available on each table for your preferred intake. Let’s start the ball rolling with the presentation of the first dish which was the Tom Yam Prawn Noodles (東炎蝦麵 – RM9-RM10 for 3 large prawns). This was served with instant noodles (Vit’s Mee to be exact). This dish had improved a lot since my last visit as the boss had taken steps to add in some tomato and abalone mushroom slices for the value-for-money bowl of noodles. The soup was thick and spicy enough for me with the fragrance coming from the added Kaffir lime leaves and mint leaves. The prawns were large and super fresh. It was a hit amongst us. Now you know why I love that brand of tom yam paste. Haha! 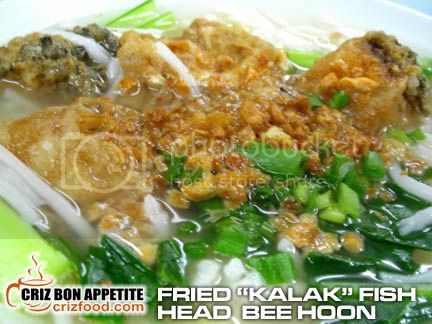 The next dish was the Fried “Kalak” Fish Head Noodles (炸魚頭清湯粗米粉 – RM6). 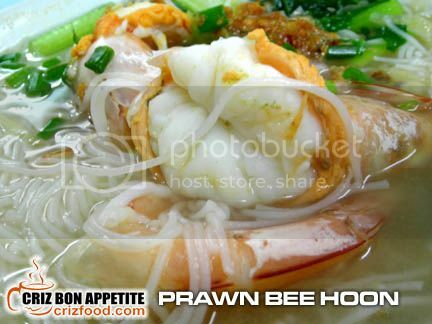 It has many chunky pieces of fried goldband jobfish head served with thick rice vermicelli (bee hoon) in clear soup. This combination is one of the most favorite orders in the café. The sweetness in the soup and the freshness of the fish blended in real well. Prawn Noodles in Clear Soup (大蝦清湯米粉 – RM9-RM10 for 3 large prawns) came up next. It came with the thinner type of rice vermicelli. I truly love this dish better compared to the earlier dish as the freshness and sweetness of the prawns brought out the best in taste in the bowl of soup. After all, better quality food sure cost almost double right? It’s really value for money considering the size of those fresh prawns. We were then served with Squid Noodles (魷魚清湯麵 – RM6). This time, it was served with instant noodles. 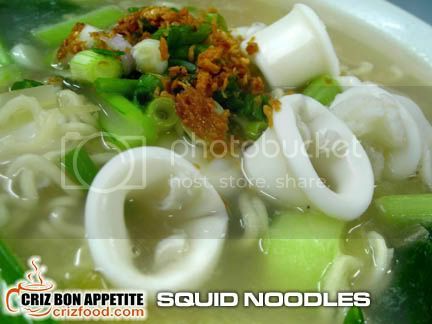 Although the squids were fresh and cooked just nice plus some with eggs (ooo.. the cholesterol level), the dish somehow tasted a bit bland due to the true nature of squids being tasteless. I would prefer them cooked with tom yam soup instead. 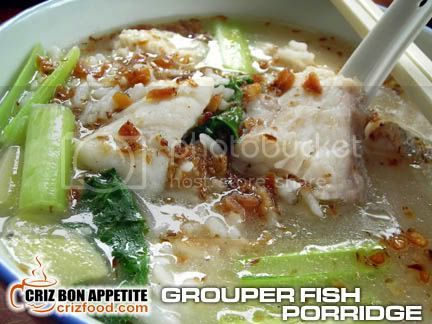 There’s nothing better than to have a bowl of hot steaming porridge served with fresh grouper fillet. 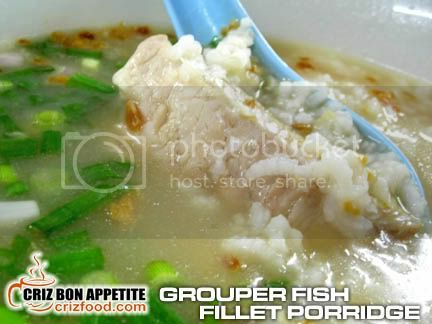 That was what we had next – Grouper Fillet Porridge (石斑魚肉粥 – RM8/75gms). The texture of the porridge was just nice and combined with the freshness of the grouper fillet, it was delicious. 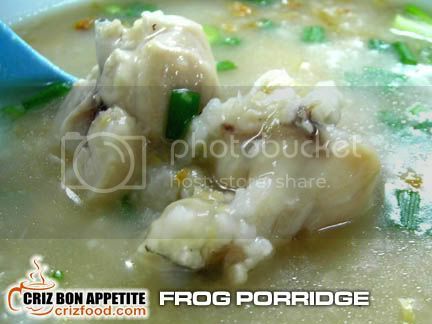 Another of their most sought after dishes would be the fresh Frog Porridge (田雞粥 -RM6/100gms). We had a large frog and this dish cost RM12. The flesh was smooth and tender as braised chicken meat. It was a delicious dish as well. It was a surprise to me that the boss chose the largest crab he has for our next dish. 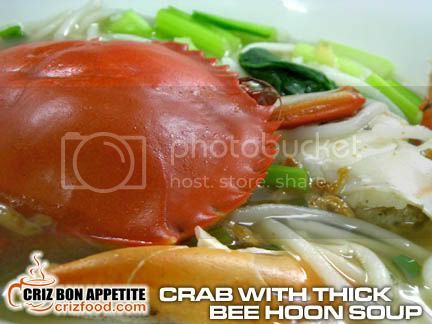 The Crab Noodles (螃蟹清湯粗米粉 – RM5/100gms), which came with thick rice vermicelli (bee hoon) cost just RM10. The unique freshness and sweetness of the mud crab indeed proved this dish to be another favorite amongst us. You can also opt for the blue flower crab (RM5/100gms – if available). You would be even luckier if you can get to try out another species by the name of Charybdis feriatus (紅螃蟹). This species is quite rare in the local water and taste just as great as the blue flower crabs. 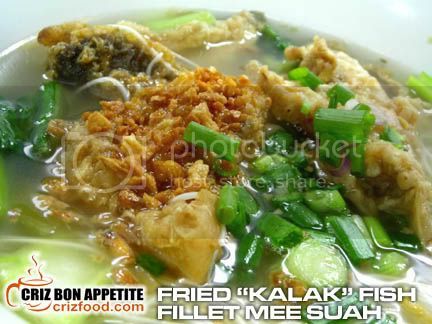 The Fried “Kalak” Fish Fillet Mee Suah (炸魚肉清湯麵綫 – RM6) also tasted great with the mee suah (wheat flour vermicelli) cooked just nice and not too soggy. We were all quite full after gobbling down so many bowls of noodles and porridges when the boss decided to throw in another large bowl of Mixed Seafood Tom Yam Soup (RM17 based on the selection of ingredients) just for us. 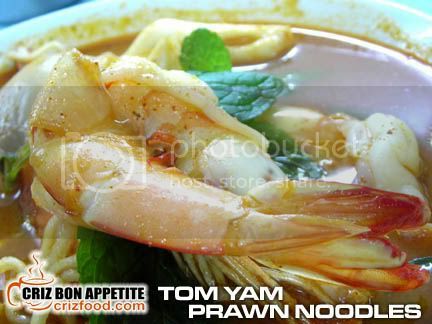 This dish was indeed a blessing to please our craving for more tom yam soup. There were lots of ingredients in it too with the availability of all the fish and meat balls, fried fish head and fillets, squids, pig kidney, etc without any trace of prawns. Can you guess the reason? The boss was so happy to see us that he forgot to add those in. He even showed me proof that he had without any intention left out the prawns. LOL! Anyway, the dish was good enough for our filled tummies. 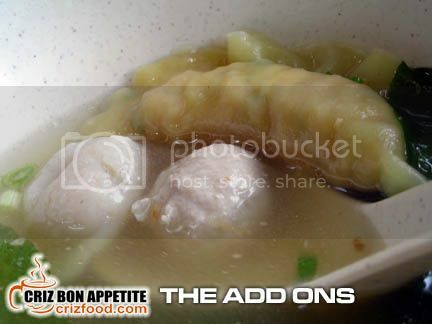 You can order this “only items based” soup if you crave for more delicious soup. If you are coming from Prangin Mall along Jalan Dr. Lim Chwee Leong, drive straight pass the Lebuh Carnarvon traffic light. You will reach another traffic light (Lebuh Pantai). Drive straight again until you have reached the Weld Quay (Pengkalan Weld) traffic light. Turn left and drive on until you have reached the third left junction (Gat Lebuh Armenian). The stall is just within the Kedai Makanan dan Minuman CF. Turn left into Gat Lebuh Armenian and left again into Lebuh Victoria and you would see some parking spaces behind the coffee house for its patrons. If you are coming from the ferry terminal, keep a watchful eye on the landmarks on your right, especially those Jetty signboards. You would pass by Lim Jetty (temple), Shell Petrol Kiosk, Chew Jetty (hawker area), Tan Jetty and you would see the coffee house by the name New Ocean (next to Pan Malaysia shop) directly opposite the Tan Jetty. There would be some parking spaces next to the coffee house for its patrons. 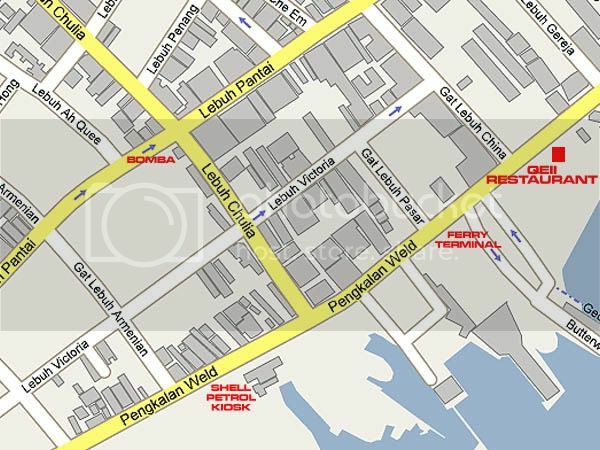 Address: 116A, Pengkalan Weld (Weld Quay), 10300 Penang, Malaysia. With the current economy downturn where everyone would be rather careful about their spending (even on food), most people would keep a look out for meals that would be economical and yet fulfilling. One great place would be at Ivy’s Kitchen where other than their home cooked food, they do also provide delicious set meals for as low as RM7.50. That would include a glass of fresh fruit juice (any fruit or vegetables as per availability) and a jelly dessert (Soya Jelly with Longan). The set comes with a bowl of plain rice served with delicious chicken rendang (dry curry), half an egg, deep fried peanuts & anchovies (ikan bilis), papadam (Indian salty cracker) and mixed cucumber & pineapple salad. 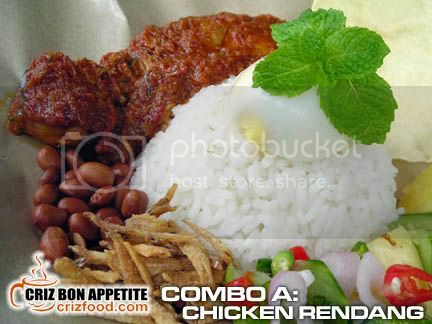 The Chicken Rendang was filled with the richness of blended spices and the fragrance from the coconut milk. Cooked almost similar to the style of Ayam Masak Merah (Red Curry Chicken), the chicken drumstick served was tender and juicy and this set got me yearning for more. The set has the same dishes as Combo A except for the main meat choice, i.e. a bowl of plain rice served with delicious beef rendang (dry curry), half an egg, deep fried peanuts & anchovies (ikan bilis), papadam (Indian salty cracker) and mixed cucumber & pineapple salad. 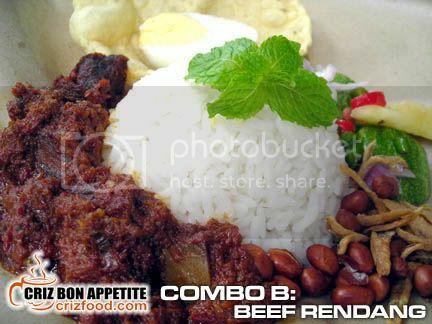 The Beef Rendang was almost similar to the texture and taste of Indonesian Daging Masak Minang (Indonesian Minang Dry Beef Curry) with the fragrance coming from the added toasted grated coconut and blended spices. The cubed beef were indeed tender with all the spices deeply marinated into the meat. 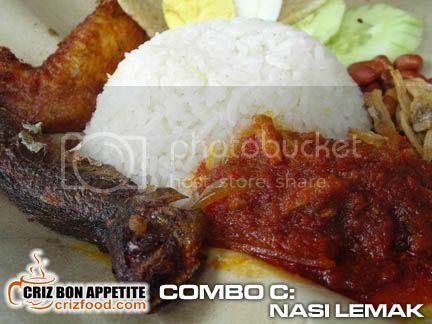 The Nasi Lemak was slightly different compared to the above two set meals. It had some coconut milk added into the rice, together with some chopped ginger prior to cooking. The steaming hot and aromatic rice combined real well with the dishes such as half a hard boiled egg, deep fried peanuts & anchovies, spicy and sour anchovy curry, crispy fried chicken, fish crackers, fried assam fish (it could be tamarind fried sardine, kembong [chubb/Indian mackerel] or selar [yellow tailed scad/ooi boey] depending on availability) and some slices of cucumber. This is a great bargain meal with so many dishes. 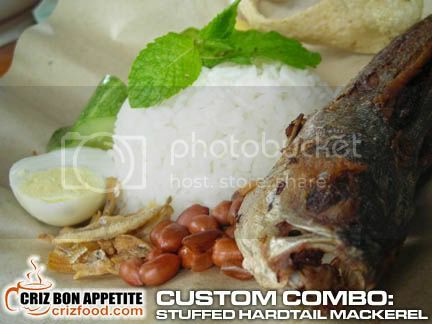 Alternatively, you could also replace the fried fish for this set with your own CUSTOM COMBO: Stuffed Fried Cincaru (hardtailed mackerel) at RM9 or RM3.80 per fish as addon. The fish was fragrantly fried with a strong hint of tamarind, blended chili and finely sliced Kaffir lime leaves. This set is catered for those who would want a non spicy and soup based meal. 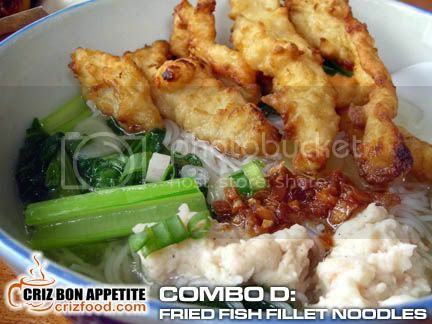 You will have the options to choose either Cintan mee (instant noodles), bee hoon (rice vermicelli), tang hoon (glass noodles) or porridge, cooked with a generous amount of choy sum (Chinese cabbage), minced chicken balls and topped with crispy batter coated dory fish fillet. 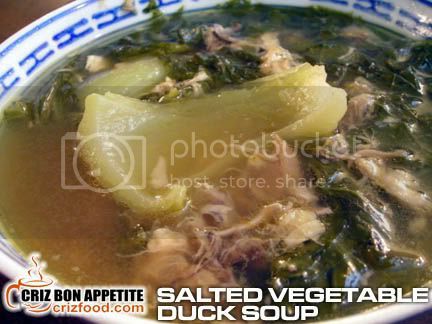 The stock used in the soup was indeed flavorful with a hint of sesame oil, garnished with some fried garlic and chopped spring onions. 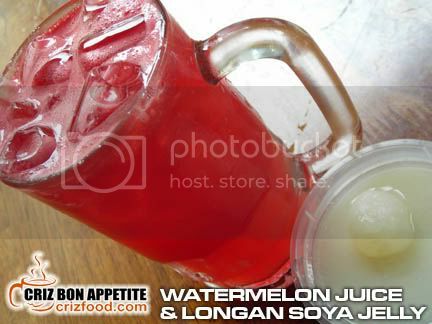 The abovementioned combos would come together with a glass of fresh fruit/vegetable juice and a dessert (soya jelly with longan). There are more side dishes and customized meals available at Ivy’s Kitchen. You would have to visit them to check those out but I’m going to share with you some of their sought after dishes. 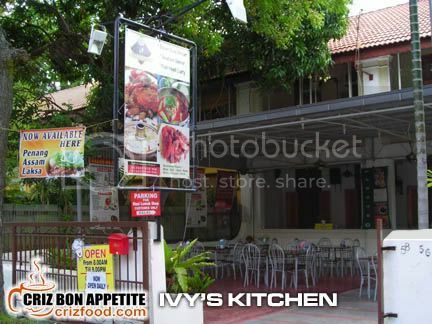 Finding Ivy’s kitchen would not be hard as it is located just 3 shop houses away from Jemputree at Jalan Burma but the only problem would be finding your way to get into Jalan Chow Thye as the road had recently being converted into a one-way street. There are actually a few ways to get to the restaurant but I will show you the easiest way to reach there with the minimum turns. If you are coming from Jalan Penang into Jalan Burma, drive all the way to the Jalan Larut traffic light (Giant Supermarket). Keep to your right after the traffic light and look out for Neww BT Café. Turn right into Jalan Arraton immediately after the food court. Drive on until you see a junction on your left (Jalan Irrawadi). Turn into the road and keep a watch out for the third road on your left (Jalan Phuah Hin Leong, Jalan Tavoy and Jalan Chow Thye) for Restoran Ros Mawar which is located at the end of Jalan Chow Thye. Turn left into the road and you will see Ivy’s Kitchen on the right immediately before Isaribi Tei Japanaese Restaurant. Alternatively, you can drive up to Goodall 2 Café (next to Jemputree) and park your car in the food court’s car park and walk to the restaurant. 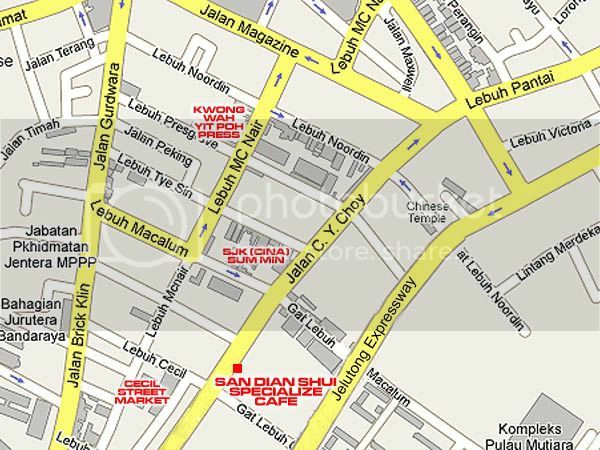 58 Jalan Chow Thye,10250 Penang, Malaysia. There are hardly many restaurants left in Penang that cater for food as good as your mother’s home cooked food, especially those food with a delicate touch of Nyonya cuisine in them. Of course those dishes would be MSG free and pork free as well. Thanks to Carrie for inviting me to such a restaurant in town. Ivy’s Kitchen has been in business for the last two years and they have been providing Mummy’s style of home cooked dinners and set meals to the public ever since. Unfortunately, not many people realized about its existence as this colonial build restaurant has the simplest dining layout with just a few tables and chairs. Many people would just forgo this place for the ambience but do not forget that some of the great food around town do come from places you would least expect. 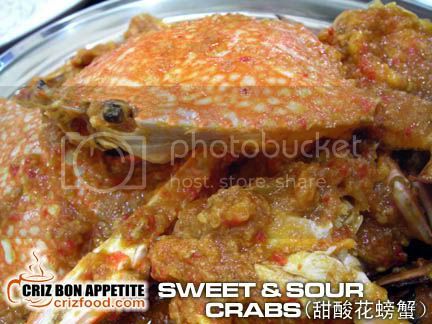 Some of the dishes that you would expect would be like the Sweet and Sour Flower Crab (RM50 – based on market price and may differ from time to time). One taste on the gravy and I knew that the ingredients used were freshly blended. Most restaurants would just use some ready made sauces that have high vinegar after taste. The flower crabs were indeed fresh and delicious. You can practically peel pieces by pieces of the flesh fully intact. This dish would be great for those non spicy food consumers although I would prefer to have them to be a bit spicier but less sweet. 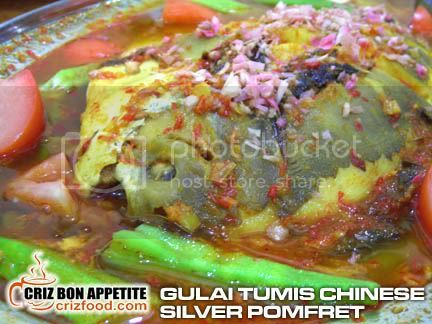 The next would be the Nyonya style of Gulai Tumis Chinese Silver Pomfret (RM62 – based on market rate). Although most restaurants would use Black Pomfret (or cheong) in this dish, Ivy’s Kitchen decided to use Chinese Silver Pomfret (Tao Tay – the most expensive fish of the pomfret family which would cost about RM55 per kg) instead for this dish. I guessed you would have to preorder this fish prior to dining there as the local pomfret would not always be so commonly available in the market. The gravy was richly filled with the sour taste of tamarind, the colors and spiciness of blended chilies, turmeric, onions, chopped ginger flower buds, lemongrass and a few more leafy herbs. Although the fish was fresh (but a bit overcooked due to a bit of hiccups at our side), it was slightly sweet to my taste bud. I think the cook should take note that fresh fish should not be cooked prior to the complete arrival of the customers, especially when it was such an expensive fish. Moreover, a lighter hand in the application of sugar (or none due to many health conscious consumers nowadays although I understood that it was a way to replace the sweetness by not using MSG) would have to be taken note seriously. 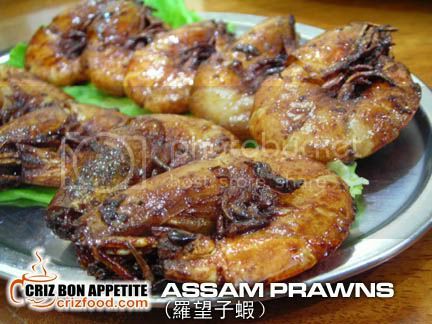 The Assam Prawns (Tamarind Prawns – RM20 for 10 prawns) was indeed a favorite amongst some of us as it was fried drier than what you would get elsewhere and with a bit of crispy sensation on the shell. The dish was marvelous except that I would still prefer my food to be a bit less sweet but then you would not get that extra crispy fragrance without sugar right? Well, another thing the restaurant should take note would be on the marinating time for the prawns. The inner taste was a bit bland as the tamarind did not soak into the flesh. My advice would be to have the prawns slightly slit at the back. The restaurant should also reconsider the price for the prawns (RM20-25 per kg in the wet market). I felt that it was a bit pricey considering that I can get five 3 times larger prawns cooked elsewhere at less than RM25. 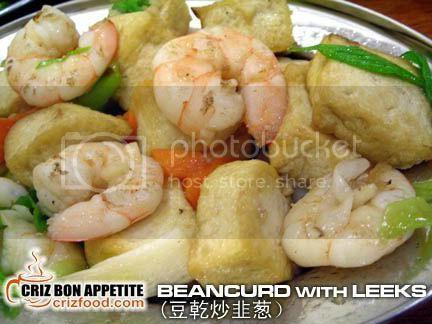 I love the next dish which was the Fried Beancurd with Leeks (RM12). The savory dish came with sliced carrots, big onions, leeks and many prawns (same sized as the above dish which I would like the management to reconsider the price compared to the quantity of prawns served in this dish). The dish had all the necessary tastes for a perfect dish. Maybe the cook can consider adding a bit of gravy when all the dishes served would be of a drier based. It has been quite some time since I had Tofu with Seaweed Soup (RM15). 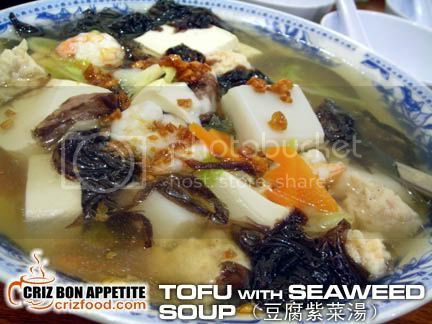 The soup in fact has lots of ingredients added in on top of the tofu cuts and seaweed. The other ingredients included sliced carrots, fish balls, cabbage, minced chicken balls and prawns, garnished with fragrant garlic oil. The soup was rich in flavor with the seaweed enhancing further the taste. I would personally prefer a bit more of clearer based soup added for this dish. No homely meal would be complete without the serving of a vegetable dish. 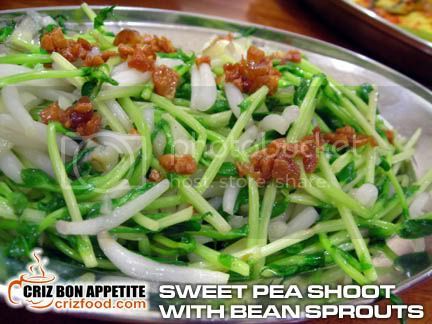 We were served with a simple yet nutritious Fried Snow Pea Shoots with Bean Sprouts (RM10). The fibrous snow pea shoots (dou miao) combined real well with the smooth bean sprouts and these were just fried with some oil and soy sauce, garnished with some fried garlic. To enhance the color and taste of this dish, a little carrot and ginger strips would make this dish beautiful. Maybe adding a bit of fried salted fish, fried dried sole fillet or even fresh seaweed strips would make the dish more flavorful. 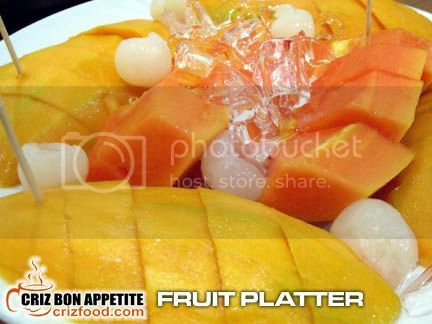 The dinner ended with a Fruit Platter (RM12) which consisted two freshly cut mangoes, half a papaya and some longan.